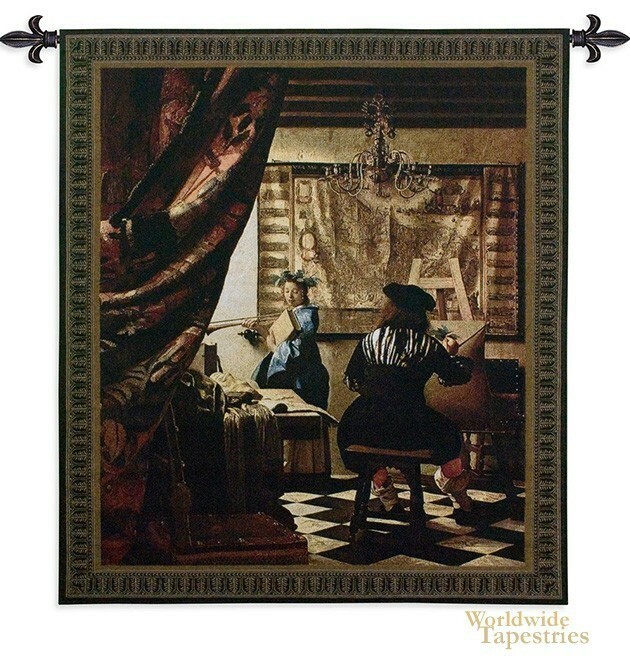 In this tapestry we see the famous "Artist Studio" or The Allegory of Painting or "Painter in his Studio" the work of Dutch artist Johannes Vermeer. This work is one of his most famous works and reflects the optical style of painting, where there is a realistic depiction of a scene and perspectives. Here we see also a clever effect of a curtain peeling back to add a dramatic entrance to the scene of the painter and his subject. This work is perhaps an art of the creation of art, like a mirror looking into a mirror, as we have an art creation looking at the creation of art. This piece is thought to be a self portrait of the artist, though the artist is facing away from the viewer. The play of light and dark in this piece is also dramatic, with the light in the distance and the rich dark colors of the foreground. The use of color is harmonious and richly dark in this work of art by Vermeer. This tapestry "Artist Studio" is backed with a lining and has a tunnel for easy hanging. Note: tapestry rod and tassels, where pictured, are not included in the price.